After a very successful year, Northern Steeplejacks would like to wish all our staff and clients a very Happy New Year and a prosperous 2017. Northern Steeplejacks Limited are pleased to welcome on board, Andy Evans as our new Contracts Manager. 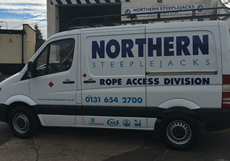 Andy has a wealth of experience in the industry and is a great addition to Northern Steeplejacks Limited. We wish all our staff and clients a Merry Christmas. 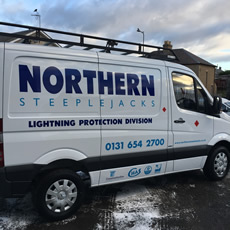 And here is the third all new van for our lightning protection system division bringing their fleet up to 4 vans covering the whole of the UK. The training continues at Northern Steeplejacks with all employees attending a refresher course on Anchor points and lifeline inspections. 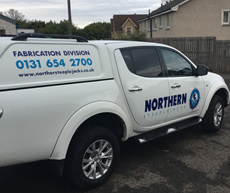 Thanks to Chris Bruce @ Western Mercedes for the second of three new vans, looks great. An example of some of the recent thunder and lightning storms. Remember you should have your lightning protection system tested every 11 months. 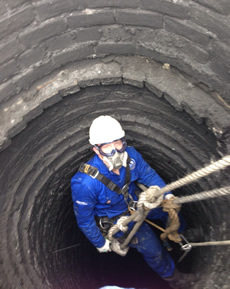 One of our steeplejacks inspecting the internal liner of a Distillery Chimney, near Elgin. 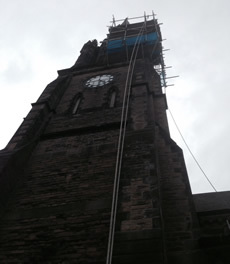 Northern Steeplejacks carrying out a high level inspection of a church spire in Manchester. Thanks to Western Mercedes on delivery of our 1st of three new vans. The sign-writer has done a great job. Northern Steeplejacks are investing in the future of the industry by enrolling 3 new apprentices to sit their NVQ Level II at Bircham Newton College, 2 lightning protection system fitters and one steeplejack. 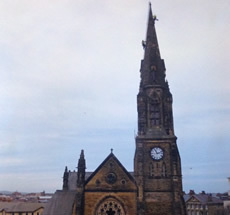 Northern Steeplejacks were engaged by a church in North England to carry out a high level inspection of the pinnacles after the recent storms and found 2 of them to be unstable and ready to collapse. We were instructed by the client to erect emergency scaffolding and to carry out full repairs and have entered into a yearly inspection schedule to stop this happening again. Happy New Year to all our staff, clients and followers on Facebook, Twitter and Instagram. We wish you all the best for 2016. Northern Steeplejacks continue to invest in our employees by sending 4 of our operatives on an IPAF course for the safe use of MEWPs and scissor lifts. Congratulations to all 4 colleagues who passed this course with flying colours. 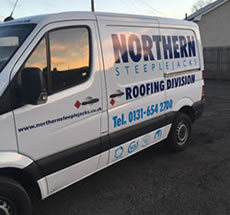 Northern Steeplejacks has been awarded accreditation from SafeContractor for the 6th year running for its commitment to achieving excellence in Health and Safety. Northern Steeplejacks would like to welcome our newest member of staff to the Company, Dean Alexander. 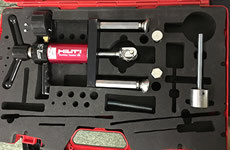 Dean will be taking up the post of Area Engineer and has over 10 years experience in the engineering and mechanical sector, bringing a wealth of knowledge which will allow the Company to expand and diversify into other sectors.